Horses come in a wide variety of colors, and often have numerous variations within any particular color. 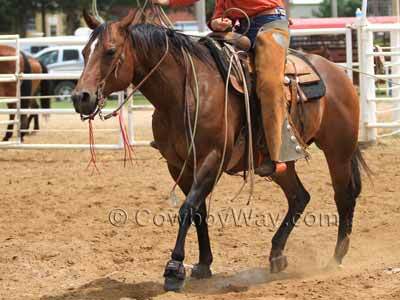 In the article on this page and the following pages we describe and show some of the more common horse colors. While reading this information it is important to understand that not every person or breed organization agrees on or defines horse colors in the same way. While our descriptions of horse colors can be considered reliable, we would like to point out that they may not be accepted by everyone as accurate. 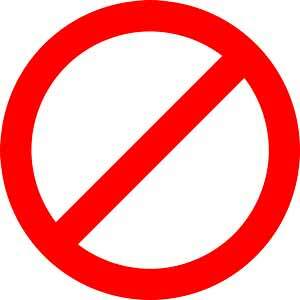 If you are registering a horse consult with the registering organization for their definitions of colors. Definitions differ from one organization to another, and may be different than the ones we've used here. A bay horse has a body color of various shades of red or reddish brown. Bay horses have a black mane and tail, and black on the lower legs. A different bay horse. This horse's body color has brighter red tones than the horse in the first photo. A bay roan horse has a mixture of red and white hairs across all or most of its body, a black mane and tail, and black on the lower legs. The head is darker than the body, usually because more red hairs are present but sometimes because there are also some black hairs. A black horse has a body, head, legs, mane, and tail that are all black. The color is a true, or dark, black all over the horse without any areas that are brownish, reddish, or a lighter color. It should be noted that white markings (like a star, blaze, socks or stockings, etc.) DO appear on black horses, and are not considered to be the lighter colorings that would cause a black horse to be classified as some other color. Some black horses can fade or be "sun burned," which means their black hairs can become bleached to a lighter color because of sun exposure. A horse like this, however, is still a black horse. A blue roan horse has a body with a mixture of black and white hairs. The head and legs frequently have more black hairs than white, making them appear darker. 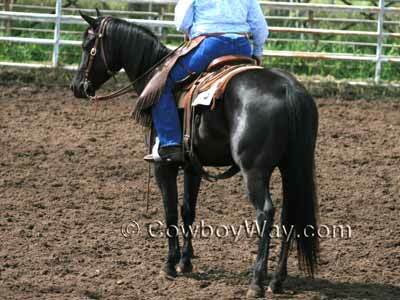 However, there are exceptions to having darker legs, particularly within the draft horse breeds. 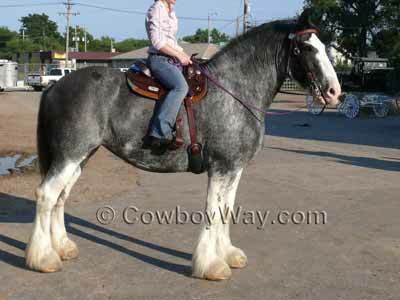 The horse in the photo below is a blue roan draft horse. As you can see his legs are not only not darker, he has tall, white stockings. Stockings like this are characteristic of some draft horses regardless of color. NOTE: Roan horses can sometimes be difficult to tell from gray horses. For tips on how to tell the difference, please see the bottom of this page. 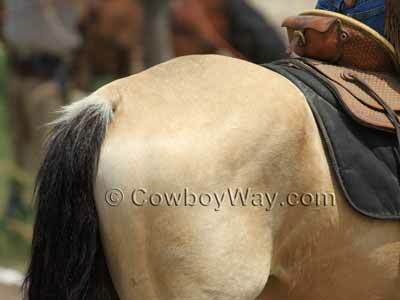 Buckskin horses have a body color of various shades of yellow or gold, sometimes with a tannish tint. Their manes, tails, and lower legs are black. 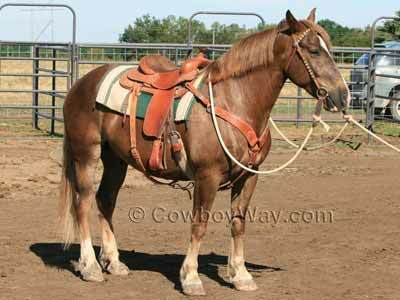 The buckskin color is similar to the dun color. 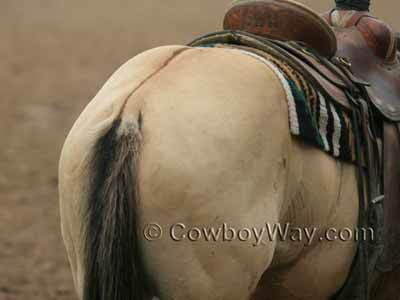 One difference is that buckskin horses do not have a dorsal stripe, while duns do. NOTE: For more information on the term "dorsal stripe" please see the bottom of this page. A buckskin horse. 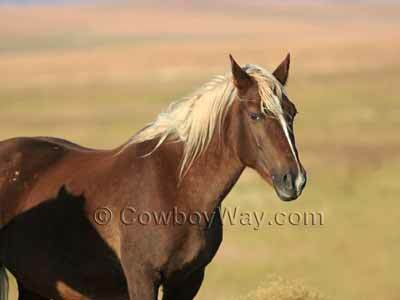 This horse's color has deep golden tones. A different buckskin horse. This horse's color has a strong tannish tint. The chestnut coat color covers a wide range of red shades, from light shades of coppery-red to deeper reddish browns. A very dark chestnut is sometimes called a liver chestnut. Chestnut horses will not have any black hairs. Therefore, a chestnut horse can have legs the same color as its body or lighter (including white socks or stockings), but cannot have black legs like some other colors. The manes and tails of a chestnut horse are the same color as the body, or lighter. If the mane and tail are noticeably lighter, they are called "flaxen." A light chestnut with a flaxen mane and tail. A dark chestnut with a flaxen main and tail. Dun horses have a body color of various shades of yellow or gold, sometimes with a tannish tint. Their mane and tail are usually black, sometimes with other colors mixed in. Dun horses always have a dorsal stripe. They frequently have black lower legs, or sometimes legs with horizontal stripes (often called "tiger" or "zebra" stripes). In addition, duns may have a stripe that runs transverse over their withers. NOTE: For more information on the terms "dorsal stripes" and "transverse over withers" please see the bottom of this page. In the photo below the dorsal stripe (the dark stripe running down the back) on this dun horse can be clearly seen. Tiger stripes on the back of the front legs of a dun horse. Tiger stripes are also called zebra stripes. A gray horse has colored body hairs that are mixed in with white hairs. Most commonly, the colored hairs are black so that when they are mixed with the white hairs the horse displays a characteristic gray color. Although not everyone looks closely enough to notice it, gray horses have black skin (as opposed to white horses which have pink skin). Gray horses are born a dark color and gain more white hairs as they age. A dark gray horse, then, is usually a young horse, while lighter grays are usually older. Most gray horses become completely "grayed out" at around age 9 or 10, meaning they don't get too much lighter in color after that (this rule of thumb is general, however, and may not always be accurate). Gray horses can vary in color dramatically from the time they are born until the time they are grayed out. Some people call older, lighter colored gray horses white, and while the confusion is understandable the horse is still properly classified as a gray. Gray horses can often be further described by terms such as "dapple" gray, "steel" (or "iron") gray, or "flea bitten" gray. A dapple gray has rings of gray throughout its coat, giving the horse a kind of spotted-gray appearance. Steel grays are a smooth blend of dark hairs and light hairs, giving the horse a solid gray appearance when viewed at a distance. Flea bitten grays have dark specks scattered over a lighter base color of white. Keep in mind that gray horses lighten with age, so a horse that is one type of gray one year may look very different a year or two later. 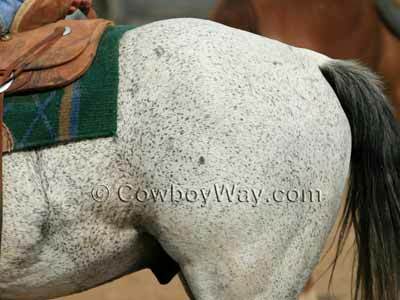 There is a rare marking that appears on flea bitten gray horses called a "blood mark" or a "bloody shoulder mark." The area that makes up the mark is not gray, but is instead some other color. Commonly, the blood mark area is red (chestnut) which gives the marking its name. You can find out more about blood marks here: What Are......Horse Blood Marks? A flea bitten gray horse. Gray horses are born dark and get lighter with age. 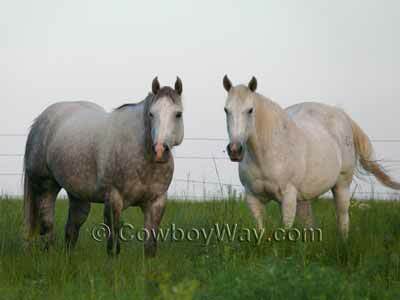 The horse on the left is a 4 year old gray mare. The horse on the right is a 27 year old gray mare. A grulla horse has body hairs that are a smoky, mousy color. The mane and tail are black, and the lower legs on a grulla horse are usually also black. Grullas often have a dorsal stripe. It's important to understand with the grulla color that each individual body hair is a smoky or mousy color. In other words, the grulla body color is not a blend of colored hairs and white hairs. Instead, each hair is a grulla color. 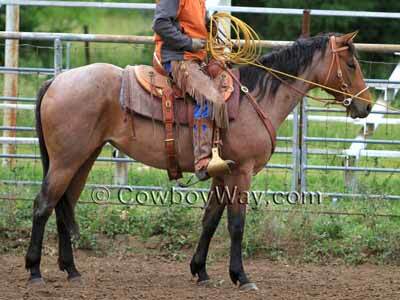 This is the same grulla horse in the photo above, shown from a different angle. You can clearly see the dorsal stripe. White markings on a horse (such as a star, blaze, socks or stockings, etc.) do not affect how a horse's color is classified. For example, if a bay horse (which has black on its lower legs) has one or more white socks, it is still a bay horse. Please note that white markings are different than spots on a horse's body. 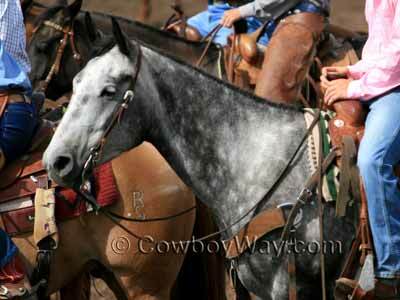 Spots usually WILL make a difference in how a horse's color is classified. For information on horse face markings, illustrated with photos, please see this page: How To Recognize Common Horse Face Markings. It can sometimes be difficult to tell a gray horse from a roan horse. In both cases, the horse's main body color consists of colored hairs mixed with white hairs. With some young horses, particularly, it may not be readily apparent if they are gray or roan and it may take some time to see how their color develops. 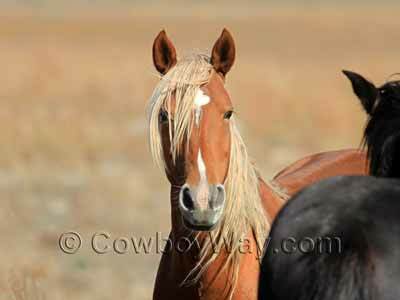 Roan horses commonly keep approximately the same ratio of white-hairs-to-colored- hairs as they age. However, it's worth mentioning some roans gain more white hairs as they age than others. Gray horses have many more white hairs with fewer colored hairs as they age, causing them to significantly lighten as they become older. In roan horses, the head and legs are often darker than the rest of the body. As gray horses age the head is often the first area to become lighter. 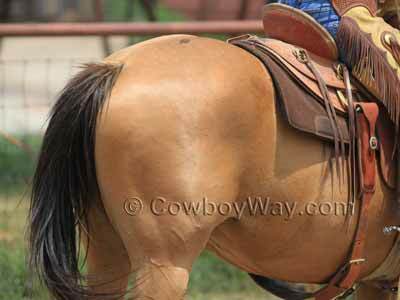 Horse Colors: What Is A Dorsal Stripe? 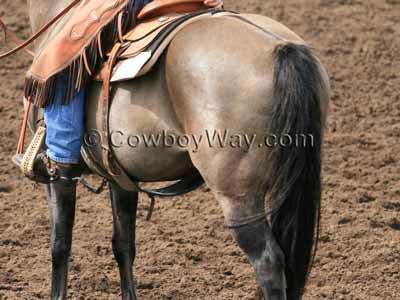 Some horse colors are defined as having a "dorsal" stripe. A dorsal stripe is a stripe of color darker than the other surrounding body hairs that runs along the horse's dorsal side. So, just what is "dorsal"? In animals that have a backbone (like the horse) the "dorsal" side of the animal is the side that lies closest to the backbone. In a horse, this is the side that is the top of the neck, the back, and the top of the rump. Another way of putting it is that the dorsal side of a horse is the side we normally think of as the "top" or "up" side. 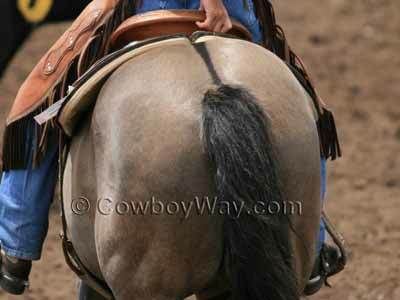 Horse Colors: What Is Transverse? 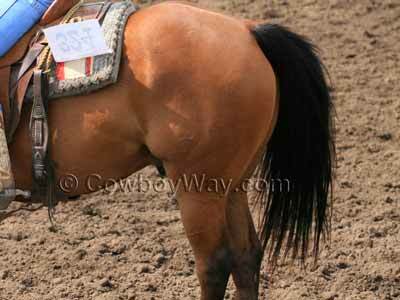 Some horse colors are defined as having a stripe "transverse over withers." Just what does that mean? "Transverse" means to lie across, or to lie in a crosswise direction from the long axis. Since a horse's longest axis is from nose-to-tail, a transverse stripe on a horse would run from side-to-side. "Transverse over withers," then, means the horse has a stripe of color darker than the other surrounding body hairs that runs from side-to-side across the withers.